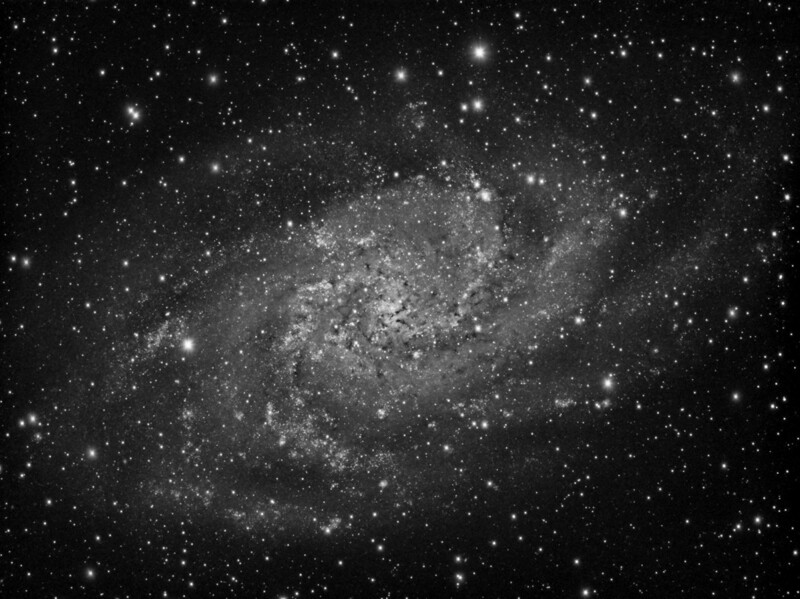 Messier 33 is a spiral galaxy in the constellation of Triangulum, and is sometimes called the Pinwheel Galaxy, a name it shares with M101, It is the third largest member of the Local Group of galaxies with a diameter of about 60,000 light years; the two larger members being our Milky Way and the Andromeda Galaxy (M31). 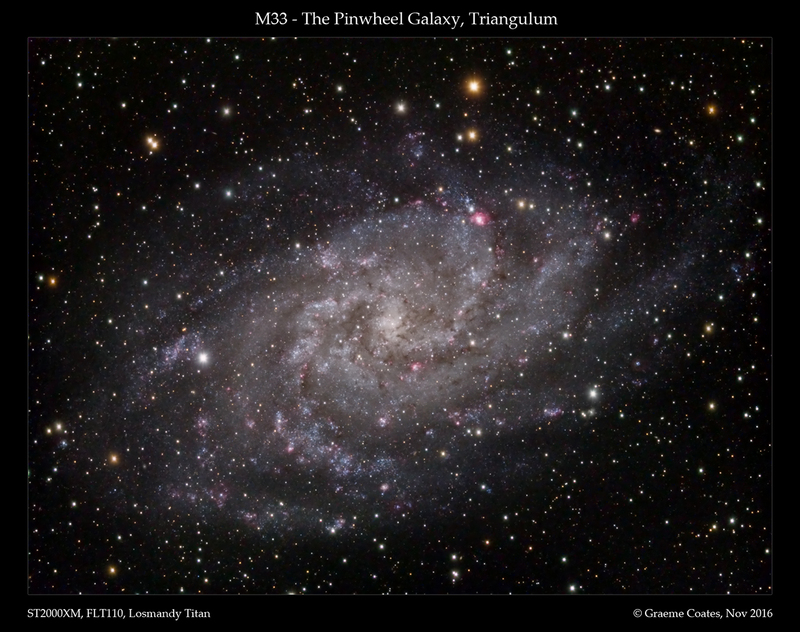 There is suggestion that M33 and Andromeda have experienced an encounter at some point in the past (and will do again in the future!). 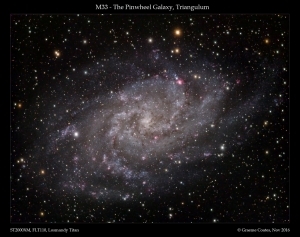 M33 is one of the most distant objects visible to the naked eye, but it is a relatively diffuse galaxy, and so it’s visibility with the naked eye and through binoculars is strongly affected by light pollution and sky transparency – in this respect, M31 is far more visible to the naked eye. 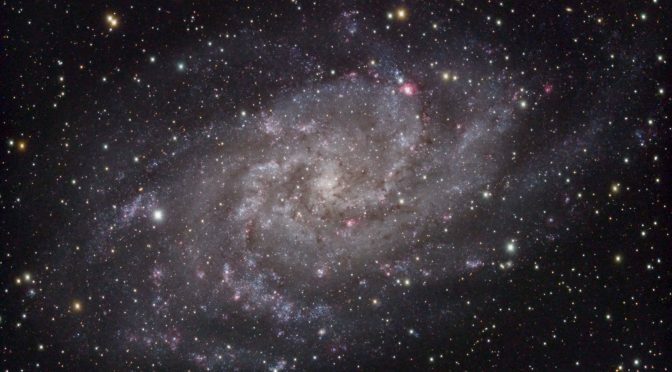 There are lots of H-II star forming regions within M33 that are visible as pinkish areas of hydrogen emission in the spiral arms. The largest of these is NGC604 which was catalogued independently of the galaxy core by William Herschel. This area is probably very similar to the Orion Nebula in many ways, and can be found to the north-east (upper-right) of the core of the galaxy (north is to the right in the images). All exposures taken at -20°C. 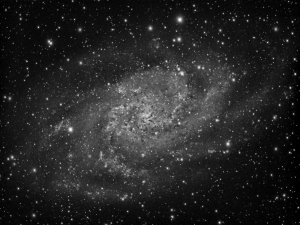 Also included here is a luminance only channel using the L channel data, that has been processed using HDR Multiscale Transform, Local Histogram Equalization and TGV Denoise to reveal to a greater extent the structure of the galaxy – in many ways this might be regarded as “over-processed”, but an interesting take on the galaxy nevertheless.